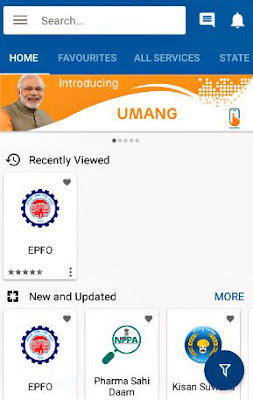 The Employees Provident Fund Organisation (EPFO) has transferred its services to the Umang app. This application is not exclusive to EPFO. Members can download the application on the Google Play store, as well as the iOS platform & Windows. 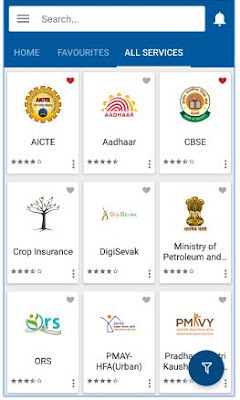 This app is published by the Ministry of Electronics & Information Technology (MoE&IT), it is a common platform for various government services such as gas booking, Aadhaar, crop insurance, EPF and National Pension System. The visitors can download the app into their smartphone by going to the app store, One can also find a dedicated link on the EPFO website or you can directly go to the https://web.umang.gov.in, in order to go to the download page. Note: This app requires the permissions to access location, SMS and calls data. The motive behind Unified Mobile Application for New-age Governance (UMANG) is all about e-governance. This app is developed by Ministry of Electronics and Information Technology (MeitY) and National e-Governance Division (NeGD). Why Is This Application Launched? UMANG app is designed for all Indians in order to give them a path to the pan India e-Gov services from the Central, Local Bodies, States & Agencies of government on SMS, Web, App as well as IVR channels. 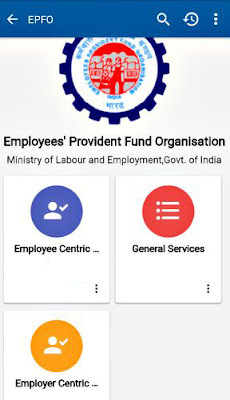 The visitors can now avail the benefits under Employees Provident Fund Organization (EPFO) on the new UMANG application as the EPFO has chosen this app to provide some of its services like- EPF Transfer, EPF Withdrawal & EPF Balance Check. 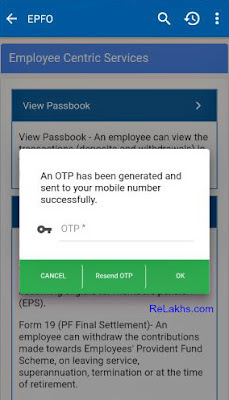 ★ Option to download EPF Passbook is also available in this application. 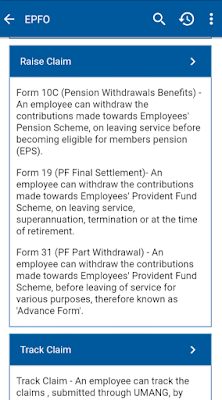 ★ Claim EPF withdrawal (Form 19). ★ Submit EPF claim (Form 31). ★ Claim EPS Withdrawal (Form 10C). When the EPFO scheme was launched the motive behind is to give retirement benefits to all the subscribers, Where some of the subscribers stuck in some problems where they need to withdraw their EPF balance. 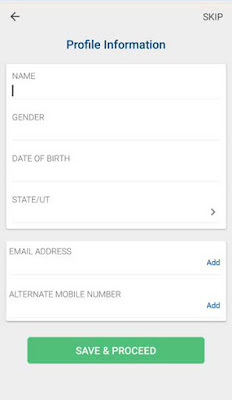 Aadhaar must be linked with the downloaded application. The visitor must have his/her UAN number activated. KYC details under UAN have completed the verification process and should successfully be approved. Can I Download UMANG App On My Windows Phone? Step 1 – To avails all the benefits that we have mentioned above, one must have instaled this app into their smartphone using Google Play Store (for Android) It requires 4.4 Android and up its size is 10 MB. With the Rating of 4.7 on Play Store. 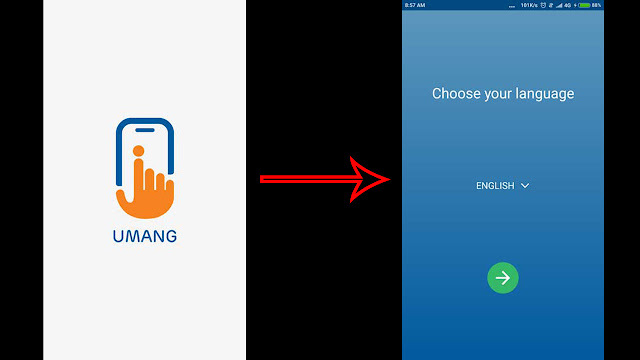 Step 2 – After successfully downloaded the application, You must now select your desired language in which you want to use the application. Here you can select from 13 different languages. 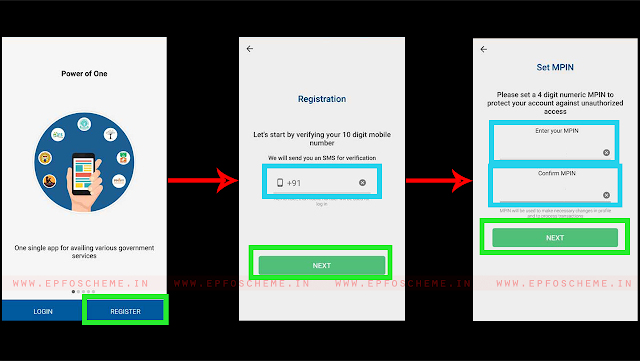 Step 3 – Now, The new user have to click on the Register tab, where they have to fill in their mobile number and make it verified using an OTP that they have received on their mobile number that he had given & set MPIN. Step 4 – After you completed steps, the application will ask you to give permissions to access for call and SMS. The next step is to enrol your “Aadhaar”. Note: The visitors who want to Claim EPF through UMANG App, Must link their Aadhaar with this app as it is mandatory for those who want to claim through this app. Step 5 – Finally, The visitors can now fill in their required personal details. Step 6 – Now, when you are on the main window of the application, Search ‘EPFO’ with the help of given search box at the top of the screen. Open the EPFO Services tab when it appears with their signature icon. Step 8 – Users who want to make a withdrawal of their EPF balance must select the Employee Centric Section to begin the further process. Step 9 – On the next screen, you will find multiple EPF services like view passbook, Raise claim & Track Claim. Step 10 – The users who want to raise an EPF claim can do the further process by clicking on the given “Raise Claim” button. Now You will be lead to a new screen where you have to enter your EPF UAN. Step 11 – Now you will receive an OTP onto your mobile number. (Registered with the EPF UAN Account). Step 12 – When you successfully filled your OTP, you can now select that what type of withdrawal claim you want to go with & then you can submit it using UMANG. Step 13 – After the successful submission of your EPF withdrawal application, the process is completed. The best thing is that there is no involvement of the employer and does not require employer’s signature in the whole process. When the submission of the withdrawal claim is successfully done, you will see a Claim Reference number that you must save onto your smartphone, dairy or anywhere else because one cannot be able to track his/her EPF withdrawal claim without the reference number. 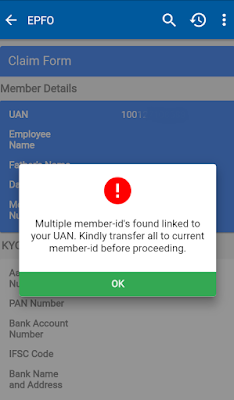 Multiple Member ID’s Found Linked To Your UAN? 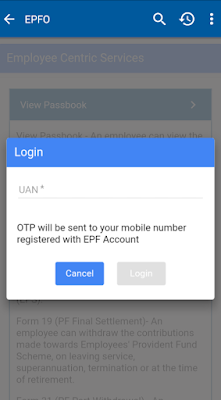 Sometimes, when the user tries to transfer his/her EPF amount from one EPF accounts to another EPF account, they’ll get an error and because of that, they are not able to submit their online claim using the Umang app. So, If this happens to you, You’ll receive an error message. Multiple member ID’s found linked to your UAN. Kindly transfer all to current member ID before proceeding. If this happens to you, You can go to our related article read the steps and follow the same in order to resolve this issue. – CONNECT MULTIPLE EPF ACCOUNTS EASILY! Next articleHow To Withdraw PF Using Smartphone?